Most collectors of Indian recordings issued as 78 rpm discs collect such records for the musical piece that the record contains whether such records are single-side recorded discs or double-sided discs. Apart from the interest in the song or tune that the record contains – nearly all 78 rpm discs have labels which provide not only the name of the song or tune, and style of music along with the artists name, but also a design or trade mark of the manufacturing or distributing company. Besides the details of the recording there are usually n mbers which provide further information and a means of identifying the disc. The numbers that are printed on the labels of records serve a multitute of purposes, primarily for the manufacturer or distributer to be able to simplify the process of manufacturing or ordering the records for sale to the general public. The several steps required to bring out a disc pressing for the record buyer are quite compilcated and require several processes of manufacturing to be able to manufacture multiple copies of the same recording. The first step is that of recording the song or tune onto a ‘wax’ disc or ‘mat ix’ as it is more generally known within the sound recording industry. The wax – once recorded – cannot be played back to check the sound quality or performance, thus, the matrix is sent to the factory where a “negative” or reverse copy is made – usually of a metal such as copper, and is usually known as the ‘mother’ or as a ‘shell’. From the ‘mother’ negative other ‘positive’ copies are developed which are known as the ‘galvanoes’ – which are then used to replicate the ‘mother’ disc for as many copies or ‘daughters’ as are required to make pressings of the discs requested by the record buying public. In the early years – 78 rpm discs for the Indian market were often pressed in as little as 100 copies per title and if the title was popular – it would be repressed in batches until the market demand was met or satisfied. Those records which failed to sell beyond their initial pressing quantity were quickly deleted from the catalogue, while those that remained popular were often repressed by the use of several ‘masters’ which whenever they wore out – were replaced by reserve copies of the ‘galvanoes’ or new ones made. To be able to identify which ‘matrix’ was being utilised for any recording – most recording engineers had to identify and number each ‘wax’ that they had recorded, and this number was referred to as the ‘matrix nUJDber’. Some recording companies employed simple means of numbering and identifying recordings by beginning at number one (1) and continuing the numerical system with each new recording taken. Of course if the recording company had taken numerous recordings then the matrix numbering sequence would just keep on growing – ad infinitum. Several early disc record companies identified both the ‘matrix” and pressing with the same number, while other recording c·ompanies devised what seem like elaborate and complicated numeral and letter coding styems for the recording ‘experts’ as they were known, and also to identify and catalogue the records being offered to the record buying public. Over the past eighty odd years there have been over two hundred record labels marketed in India, but by far the most famous of all of these is HIS MASTER’S VOICE. 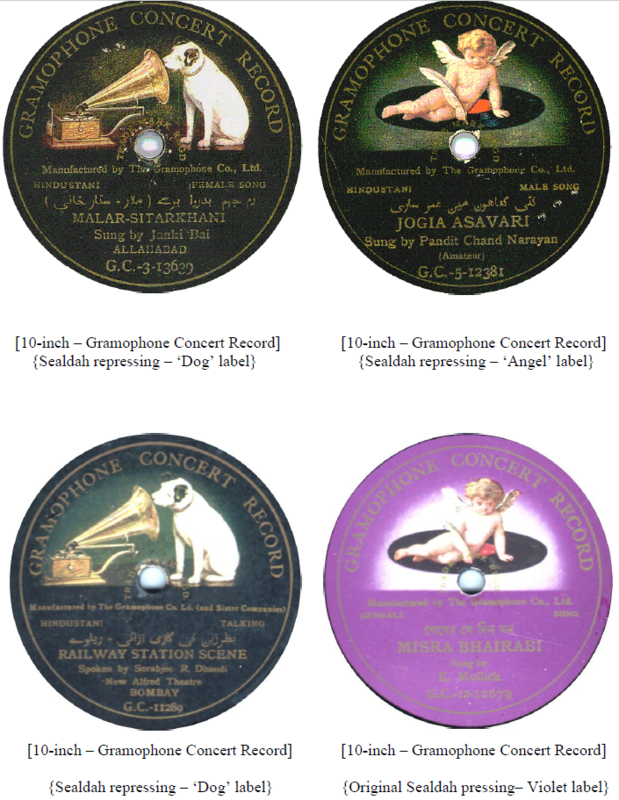 Disc records actually labelled as “HMV” with the picture of the ‘dog and gramophone’ were not issued until January 1916, but before the The Gramophone Co., Ltd., in India had been marketing Indian repertoire under GRAMOPHONE RECORD (7”), GRAMOPHONE CONCERT RECORD (10″), and GRAMOPHONE MONARCH RECORD (12″) disc records – these black labelled discs. were manufactured at Hanover in Germany from 1903 up to early 1908, and all were issued as Single-side recorded discs only. Up until December 1907, these black labelled disc records with a small monogram of the ‘recording angel’ were marketed by The Gramophone and Typewriter, Ltd., and Sister Companies, but from early 1908, they were the product of The Gramophone Company, Limited, and Sister Companies. The last batches of German pressings have the words “Made in Germany” stamped in indelible ink on the label, as a means of identifying the German pressings from the forthcoming Indian pressings. This description of the place of manufacture had also been recently introduced as a requirement of all imports coming into India. In 1908, the shells and galvanoes for the Indian, Burmese and Ceylonese repertoires were transferred to Calcutta, where The Gramophone Co., had established a record pressing plant at 139 Beliaghatta Road, Sealdah. 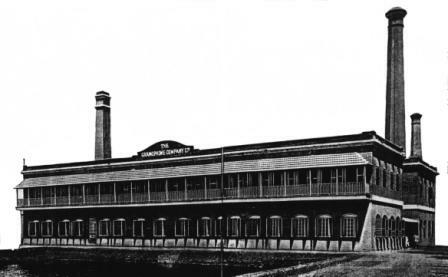 This factory was to become The Gramophone Co.’s record pressing plant for the whole of Asia. The original German manufactured Single-side disc records have – on the blarik reverse side – Reproduced in Hanover, while the Indian pressings have the wor1ing – Made in Calcutta, embossed at the edge of the printed label. In about October 1910, the plain black labelled GRAMOPHONE RECORD (7″), GRAMOPHONE CONCERT RECORD (10″), GRAMOPHONE MONARCH RECORD (12″) releases were given iliustrative labels of either the ‘recording angel’ or the ‘dog and gramophone’ – but were still not called HIS MASTER’S VOICE records. In 1912 and 1913 several disc records that had been available as single-side recorded disc were re-issued as double-sided discs, and in 1915, several of the best selling discs were given Violet coloured labels and the selling price of these discs given as 3 rupees and 12 annas, compared to 3 rupees only for the regular black label discs. Although there were numerous records re-issued from the black to violet label, all recordings of the South Indian vocalist – Coimbatore Thayi – were issued -exclusively – on Violet coloured label – with her 10″ inch records selling for 3 rupees 12 annas and the 12″ inch discs at 5 rupees 8 annas each. Between 1908 and 1910, several record labels of European origin had issued a large number of Indian recordings and threatened to carve up the record marke_t in India, which had grown dramatically over the past few years. Amongst those labels to be introduced to the Indian market were BEKA GRAND RECORD, ODEON RECORD, NICOLE RECORD, RAM-A-PHONE DISC RECORD, JAMES DISC RECORD, SINGER RECORD, and the SUN DISC RECORD. The SUN DISC RECORD caused a great upheaval in the Indian disc record market, in that they were being offered for 2 rupees per double-sided record, while all other makes were selling for 3 rupees or more. The Gramophone Co., answered this challenge by introducing their own 2 rupee double-sided disc under the ZONOPHONE RECORD label. The ZONOPHONE RECORD was used to release new recordings that had been held in reserve and also to re-issue many recordings that had prevoiusly been released as GRAMOPHONE CONCERT RECORD’s. By October 1914, the ZONOPHONE RECORD had become the major cheap-priced record on the Indian market and was given a double-face letter prefix series beginning at N-1 for 10″ inch series and V-1 for the few 12″ inch ZONOPHONE RECORD issues. In late 1915, the best selling titles in Indian repertoire of The Gramophone Co., Ltd., were issued with the HIS MASTER’S VOICE label, including the words and picture. The HIS MASTER’S VOICE label introduced a new double-face number series that began at E-1 for 7″ discs, P-1 for 10″ discs, and K-1 for 12″ discs. With the first release of the P- series of January 1916, were some one thousand three hundred double sided discs that had been previously issued. Although recording of the 7″ inch size had ceased some years earlier, and there were comparatively few 12″ recordings being taken – all those titles still in the catalogue were given E- and K- double-face ‘catalogue’ numbers respectively. Considering the above information it is possible to find three or four different pressings of the same recording, and in some cases it is possible to find the same recording under six different labels. 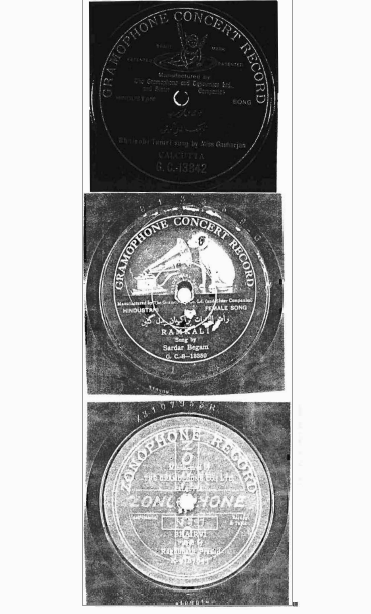 Some recordings which were first pressed at Hanover can be found as GRAMOPHONE CONCERT RECORD (Reproduced in Hanover) an Indian pressing: (Made in Calcutta), as a ZONOPHONE RECORD: both with single-side number in the X3-series and as a re-issue in the N- series and as an illustrated GRAMOPHONE CONCERT RECORD, and as a HIS MASTER’S VOICE pressing in the P- series. This information about the various labels and designs used for disc records issued by The Gramophone Co. Ltd., up to 1916, simply defines the label styles used by the company, but both on the label and on the disc there are other numbers which provides comprehensive details about which record ‘expert’ took the recording; what type of recording it is; and how the particular recording fits into it’s own category. This information is given by a combination of the ‘matrix’ number which is either inscribed or embossed on the disc record face in the blank portion following the end of the recorded work, and sometimes inscribed beneath the printed label. The next piece of information concerns the coupling or catalogue number, usually given – on the early discs – beneath the artist’s name. This ‘catalogue’ number on single-side recorded discs, or the ‘coupling’ number on double-sided discs, provides us with information about the type of recording for all releases of The Gramophone Co., from 1899 up to 1929, when a new system was introduced. The ‘matrix number’ usually combines a number with a prefix or suffix letter which relates to both the recording “expert” who took the recording and the size of the disc. The Gramophone Co., started with one recording “expert” in 1898, named Frederick William Gaisberg. William Sinkler Darby and William Conrad Gaisberg joined shortly afterwards, then others including George Dillnutt, the brothers Franz and Max Hampe, followed by many others. The following list gives only those recording “experts” who took recordings or who based in India as recording “expert” for the Indian and Asian region. GRAMOPHONE COMPANY – Recording experts and their Indicating codes. Although the ‘matrix’ number tells us which recording “expert” took the recording and the size of the recording – it does not provide us with any information abou where and when that ‘matrix’ was recorded, and leads to yet another dimension of research in which – unfortunately – the leading record researchers the world over are still confounded by. Although in some cases recording ledgers or dairies have survived – for the most part these recording ledgers pave either been destroyed or lost. The allocation of ‘matrix’ numbers to the ‘catalogue’ number seems to have been dete mined – simply by the arrival of the original ‘matrices’ at the record piessing plant of Deutsche Grannnophon A.G., at Hanover, Germany. 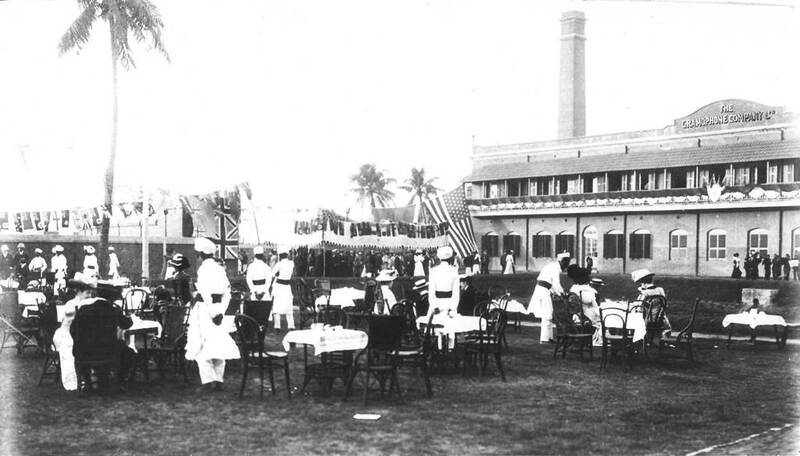 This company’s method of allocating a ‘matrix’ number to a ‘catalogue’ number remained in force as far as the Indian, Burmese and Ceylonese repertoires were concerned, until the transference of activities to the Sealdah record factory in 1908. The ‘catalogue’ number describes the “country or region” in one digit, the type of recording in the following one or two digits and lastly the number of the particular recording in that series or style of recording. 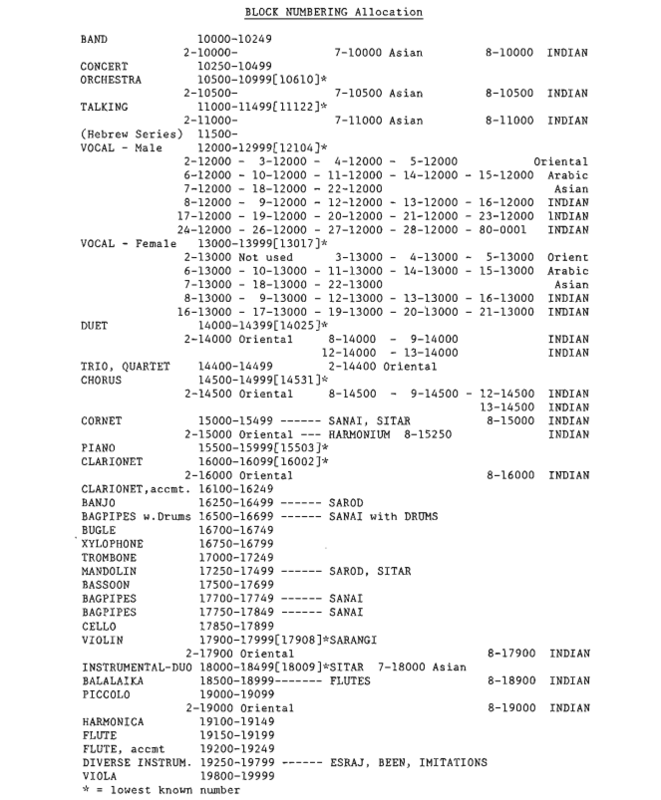 Each coded recording of l = country 0000 = style through to 19999 allows us to identify with some certainty the vast majority of recordings made of ‘oriental’ music by The Gramophone Co. over a period of about thirty years. The first digit of this ‘block numbering’ system indicated the language of the recording. English recordings had no language digit, 1+0000 was for all ‘Oriental’ or Eastern recordings from Arabic to Chinese, and includes Russian oriental such as Kazak, Usbek. Also Turkish, Japanese, Bulgarian, Serbian, Algerian etc. Bearing in mind the ‘oriental’ block was not used exclusively for Indian recordings, an Arabic title could be followed by a Burmese title which could be followed by a Turkish title – followed by an Indian recording – and so on. The following chart gives the original ‘block numbers’ allocated for each type of “Oriental” recording of The Gramophone Co., and variations utilised for India. In any given series once the block of numbers allocated for a particular series had been filled – the ‘block’ would be prefixed by a numeral, which indicates the second and subsequent use of the category. Although the ‘block numbering’ allocations listed above generally run true to form there are anomalies and occasional exceptions of records which do not conform to their correct ‘block’, along with a number of recordings of Female singers – of recordings made by William Sinkler Darby in 1904-05 which were allocated to the Male vocal ‘block’ and retained these wrong allocations throughout their existence in the catalogue, even when transferred to HIS MASTER’S VOICE P- series. The ‘coupling’ numbers originally given to GRAMOPHONE CONCERT RECORD’s were replaced by the equivalent ‘block’ in the ZONOPHONE RECORD system when transferred to ZONOPHONE RECORD, and occasionally titles which had first appeared as ZONOPHONE RECORD releases were tranferred to the “Gramophone” block system when transferred to HIS MASTER’S VOICE. The Sealdah factory was responsible for ill Far Eastern records with th effect that the eighth series 8- is followed by 9- but then followed by 12- then 13-. The seventh 7- being reserved for Siamese, Malay and other “far eastern” recordings, while the 10-,11-,14-,15-, series were reserved for “middle eastern” recordings. Within those series used for India are also all Burmese and Ceylonese recordings which occupy “chunks” or sections of the “Indian” blocks. While there was some back-filling of ‘block’ systems the 8- series in general – marks the commencement of record production at the Sealdah factory for new Indian, Burmese and Ceylonese releases. Yet another spin-off from the sequence of usual GRAMOPHONE CONCERTRECORD and ZONOPHONE RECORD releases was the immense popularity of the Hindustani vocalist and Harmonium player – Mohomed Hussain, who had made hundreds of repordings for The Gramophone Co., and just about every other recording company that had been active in India between 1905 and 1915, The popularity of Mohomed Hussain’s disc records (on any label) led The Gramophone Co., to introduce a short lived but unique series of selected recordings of this artist on the CINCH label. This curious little development – selected eighteen records of Mohomed Hussain which had been issued as black label GRAMOPHONE CONCERT RECORD discs – re-issued as Yellow label GRAMOPHONE CONCERT RECORD’s in April 1914 – under their original ‘coupling’ numbers – then – tranferred to the yellow CINCH label in July 1915, with their own ‘catalogue’ numbers running from Ca to Cr – coupling Ca with Cb, Cc with Cd, and so forth to Cq with Cr. 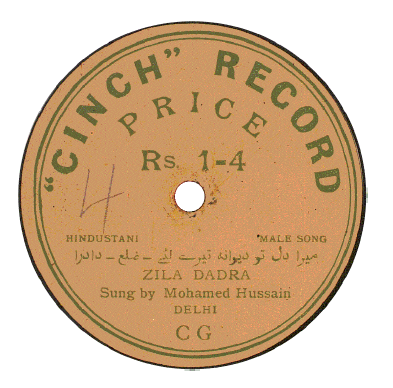 These CINCH releases were sold for the very low price of 1 rupee 4 annas – and primarily issued to combat the vast number of releases of Mohomed Hussain appearing on other record companies labels. By October 1915 there had been a further re-issue with variant re-couplings of the CINCH releases – re-issued as black label GRAMOPHONE CONCERT RECORD’S again, and these titles were then transferred to the HIS MASTER’S VOICE P-series in January 1916. The yellow CINCH label was only used in India for this little exercise and not for any other purpose. In essence this explanation of The Gramophone Co. Ltd’s matrix and numbering systems accounts for some 25,000 matrices of their Indian repertoire taken between 1903 and 1921, to which must be taken into consideration all of the other “repertoires” recorded by the company’s recording ‘experts’ or engineers. The ZONOPHONE RECORD either with their single-face coupling number under X3 or X7, and under the N- series are always deep green. 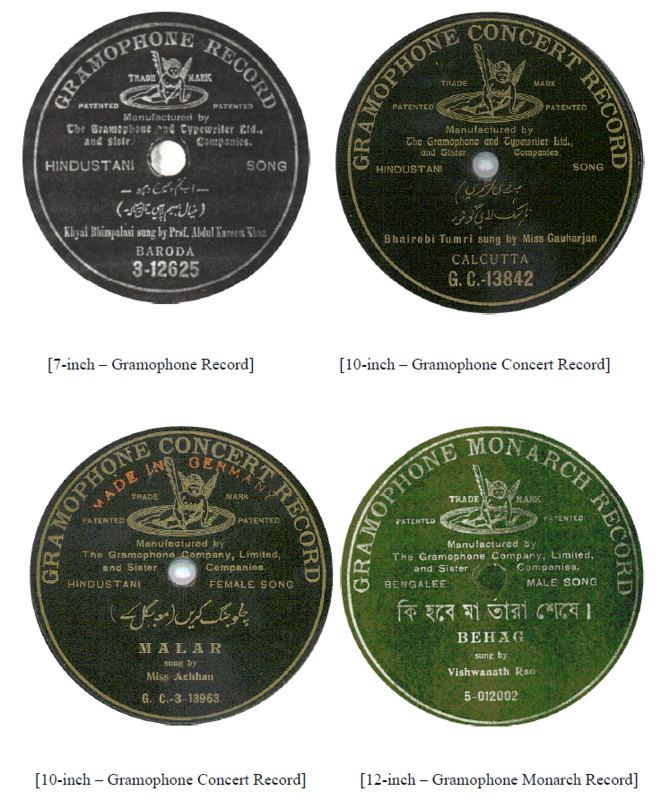 The early GRAMOPONE RECORD (7″), GRAMOPHONE CONCERT RECORD (10″), GRAMOPHONE MONARCH RECORD (12″) were always black with gold printing except for a few yellow with black printing of Mohomed Hussain – which were transferred to CINCH as mentioned above. With the introduction of the ”illustrated” black label in October 1910, there are some records which have the ‘recording angel’ in colours, and others which are in brown •monochrome’ only. The same configuration of colours – or lack of it – occurs with the ‘dog and gramophone’ pictured discs – and yet others have the ‘recording angel’ on one side and the ‘dog and gramophone’ on the reverse. The introduction of the ‘Violet’ coloured labels in 1912 and 1913 continued this practice. There were also deep green coloured labels for several ‘Bengali releases. Some releases by Miss Janki Bai and a couple of other popular female singers were given navy coloured labels. To begin with, the HIS MASTER’S VOICE P- series was black with gold writing with the ‘dog and gramophone’ illustration in colour – but may also be found with the brown or monochrome style of printed label. The significance of the colour of these labels was related to the selling price of the record – which for the black labelled HIS MASTER’S VOICE P- series was 3 rupees, while all while green, navy and violet coloured labels were 3 rupees 12 annas. The Siamese HIS MASTER’S VOICE records had yellow labels, and the Burmese had red labels, plus there were releases with plum labels. The selling price of these records remained fairly constant from 1910 through to 1917, but in by 1918 the price structuring had moved down for some label styles and colours and up with others. During 1924 releases in the ZONOPHONE RECORD N series from Nl441 upwards were given Green labels with a simply overprinting of the ‘dog and gramphone’ trademark in gold print. From N1441 up to Nl493 the X3-, or X7- ‘Zonophone’ coupling numbers were used, but from Nl494 all subsequent releases used the ‘Gramophone’ block numbering system, and with this change those ZONOPHONE RECORD’s which were still in the catalogue were given HIS MASTER’S VOICE Green Dog labels, until such titles were deleted. In essense the introduction of tbe HIS MASTER’S VOICE Green dog label marks the demise of the ZONOPHONE RECORD labelled disc in India. HIS MASTER’S VOICE – Green Dog label continued to be sold at the old ZONOPHONE RECORD price of 2 rupees and 12 annas, at least up until 1928 and the introduction of the TWIN label, but by then the N- series had become the mid-priced label sandwiched between the cheaper priced TWIN label and the higher priced P- series of HIS MASTER’S VOICE label. Tracing out every Indian matrix recorded by the company or just the main recordings made by a particular artist has been a complex and bewildering task for any researcher or record collector, and the above information is not the end of the story for even these ‘matrix’ numbers or releases under the various labels mentioned here. In several instances – recordings were held in reserve for up to ten years in some cases and only issued upon the death of a performer or in competition with another version of the same song or tune issued by a rival record company. 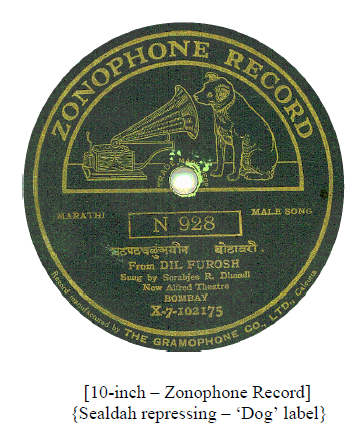 Many record collectors and researchers of Indian recordings have simply noted the P- number when dealing with HIS MASTER’S VOICE discs or the N-number on ZONOPHONE RECORD’s and in doing so have lost the relevance of both the ‘matrix’ and ‘coupling’ numbers which up until 1928 were always accessible on the disc face or printed label. 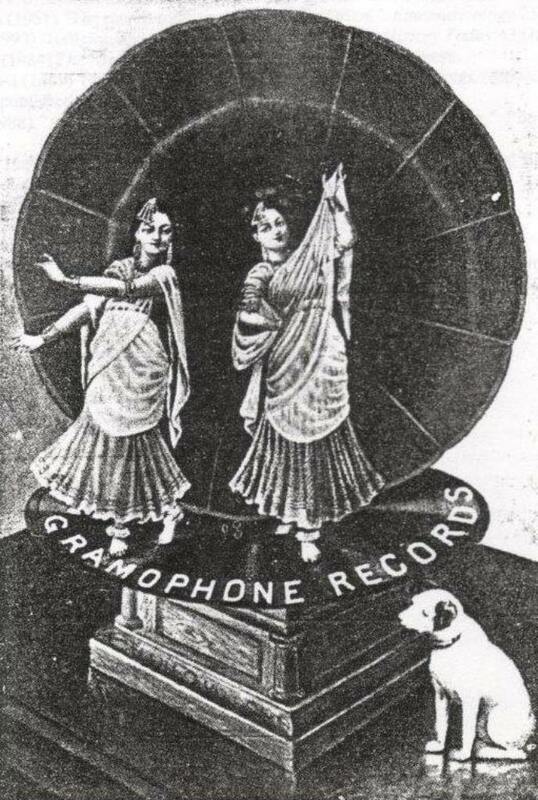 Armed with the explanation of how The Gramophone Co. Ltd., in India marketed their products, notating these other numbers provides the “real” clues as to when a recording was ‘taken’ and subsequently placed on the market, and thus are of far greater importance than the ‘catalogue’ number which primarily is given tosimplify the process of ordering the disc required by the dealer for sale to the record buying public. 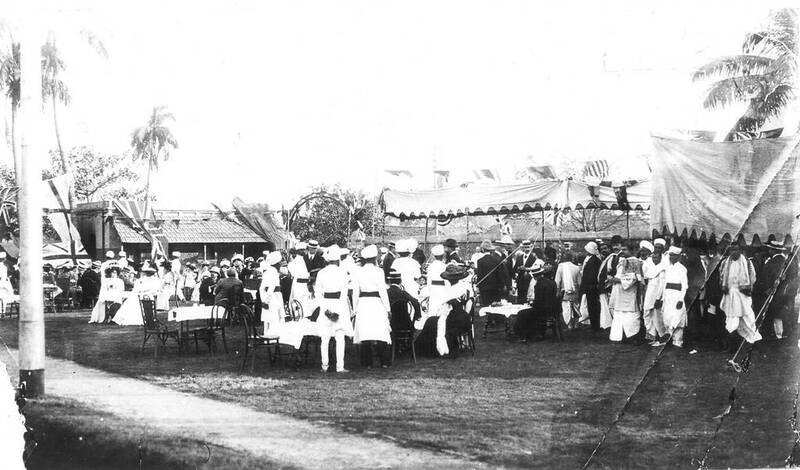 The Opening of The Gramophone Compny, Ltd, factory at Sealdah, Calcutta on 18 December 1908. To complicate matters even further – the HIS MASTER’S VOICE P- series was sectionalized in about 1919, thus the continuity of continuous numbers was broken up. In 1926, the ZONOPHONE RECORD N- series releases which were still in the catalogue were transferred to a Green HIS MASTER’S VOICE label, which by 1928 had been transformed into the basis for the Plum labelled HIS MASTER’S VOICE label. Compounding research problems even further – by 1928 the green ZONOPHONE RECORD had basically been abandoned and transformed into Green HIS MASTER’S VOICE, and in place of the cheaper priced ZONOPHONE RECORD came the yellow TWIN label, which was also used for both new releases and a profusion of re-issues of titles that had been released on a variety of other labels controlled by The Gramophone Co., Ltd. With the emergence of the TWIN label, the ‘coupling’ numbers were dropped from the printed label – with only the T- or FT- ‘catalogue’ number and the ‘matrix’ number being printed on the label. 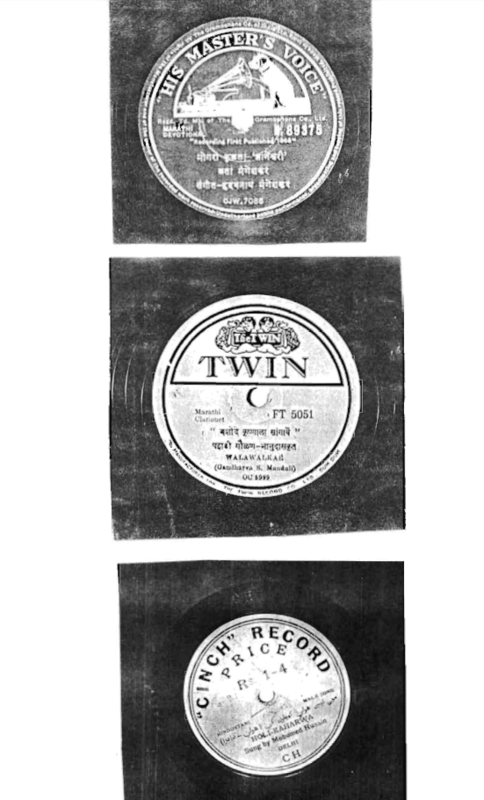 ‘THE TWIN’ record label, that was introduced in India in 1928 by The Twin Record Company, Calcutta, was little more than a subsidiary concern of· The Gramophone Co., Ltd., but was marketed in India as though it was a totally separate record company, with it’s own separate wholesale agents and retail outlets, one of which still survives, at least in name in Bombay today. THE TWIN’ record label presents another source for tracing recordings which had been previously issued on GRAMOPHONE CONCERT RECORD, HIS MASTER’S VOICE, or ZONOPHONE RECORD. On ‘THE TWIN’ record label were issued many recordings which had been held in reserve stocks by The Gramophone Co., Ltd., – some for up to ten or more years, and also issued recordings that had been on the company’s catalogues on various labels going back to 1905. 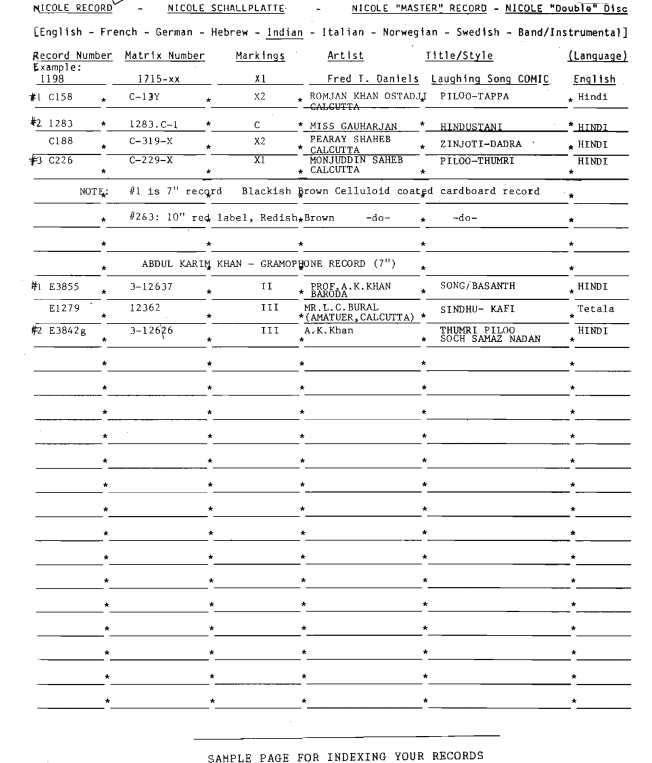 The first of the yellow 10 inch ‘TWIN’ releases were given a ‘T’ prefix beginning at number 151, and an 8 inch series with the ‘FR’ prefix which began at number 1 and ran up to FH-150. At number 198, the ‘T’ series was converted to ‘FT’ and included releases in Burmese, which were given red labels, By the end of 1931 about one thousand releases had been issued on ‘THE TWIN’ label, and a European series begun at number 1000, the normal Indian series continuing on at number 2000. In the main ‘THE TWIN’ record label was The Gramophone Co., Ltd.s’ low price label, and survived from 1928 right up to 1970. For record collectors there are many issues on this label which might not be found in their original labels, and although the ‘coupling number’ of the original has been removed, the ‘matrix’ number is always printed on the label. The releases numbered from T-182 to T-192, and FT-198 to FT-208, and FT-412 to FT-413 replicate – song for song, coupling for coupling a series of recordings made by Peara Sahib for the ‘RAMAGRAPH’ record label in the RAMAGRAPH 5000 series. During the 1930’s ‘THE TWIN’ record label was used as a vehicle of competition for the several record companies that had started up in India, so it is not unconnnon to find recordings on ‘TRE TWIN’ record label, issued or re-issued in the 1930’s of recording artists whose current success was with another record company. By the early 1930’s ‘THE TWIN’ record label had replaced the ‘ZONOPHONE RECORD’ with the previous ZONOPHONE RECORD – N- series becoming the mid-priced label with a plum colour, while the red labelled P- series of HIS MASTER’S VOICE releases was the higher priced label. By 1932 tbe HIS MASTER’S VOICE P- series had reached P-10740 – within which were numerical blocks that were not completed, along with blocks that were used for particular language groups – such as Hindi, Bengali, Marathi, Tamil, Telugu, Gujarati, etc. with other sub-divisions for non-Indian repertoires. Numerical blocks well beyond the Indian sequence were also in use such as P-14500 for Burmese, P-15200 for Ceylonese, P-15500 for Cantonese, and others. The P- series had essentially been used as the “premium” and more expensive label, while the N- series had been developed as the middle price label, while THE TWIN label remained as the cheaper priced label. Caution should be taken in reading any record label of any discs issued by The Gramophone Co., Ltd., in India, for while the above information could be treated as a fairly comprehensive guide to all issues on the various labels under the control of the company – the most important piece of information on any of these disc records is in fact the ‘matrix’ number and the ‘matrix’ number is not usually printed on the paper label of these discs and has to be found by examining the incised or embossed markings of the surface of the disc usually in the area between the end of the recording and the edge of the printed label. 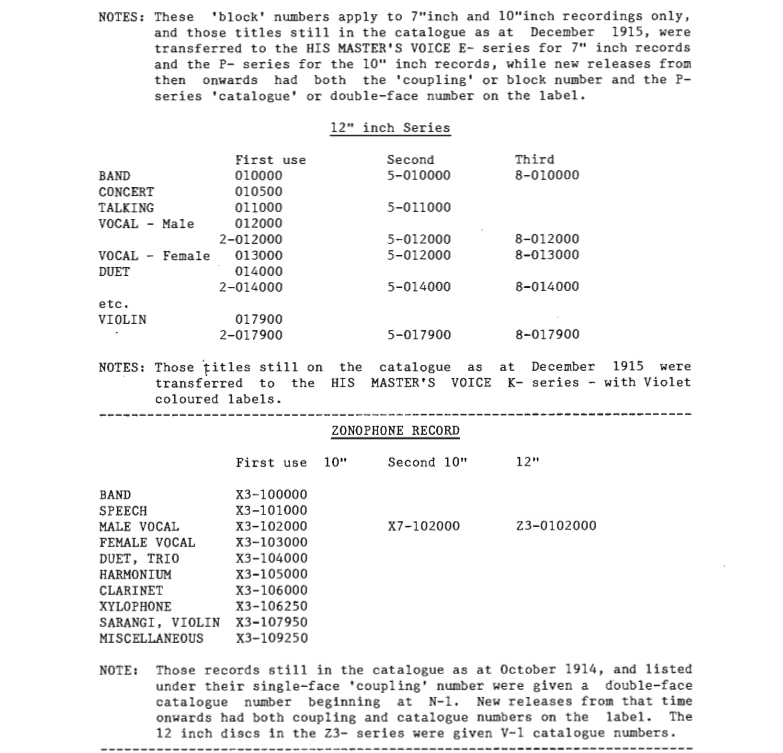 The ‘catalogue’ or ‘coupling’ numbers can at times identify performers recordings which are far apart in the actual number to number sequence of recordings taken. The double-face catalogue numbers such as in the P- or N- series also have no direct relevance to the progressive use of ‘matrix’ numbers – ev n though at times they may appear to be in sequence. For those music lover’s and record collector’s whose primary interest is in the songs or tunes that these old 78 rpm records contain the above information may seem an unnecessary complication to their enjoyment or love of a particular song or tune, but even a basic interest in the data printed on these record labels can reveal hidden treasure, not the least of which might be that Ustad Mustak Hossein [1880-1974] made his first recordings in Bombay in 1908 – and were issued on ZONOPRONE RECORD’s as well as GRAMOPHONE CONCERT RECORD’s, or that Miss Gauhar Jan [c.1875-1930] was actively recording between 1903 up to 1928. The legendary sitar player Imdad Khan, the grand-father of Vilayat Khan – made recordings in December 1904 at Calcutta – two recordings of which were re-issued in October 1931 on the TWIN label, That the ‘gramophone celebrity’ and legendary Sanai player Talim Hussain, made cylinder recordings along with hundreds of disc recordings – but has been totally forgotten today. The Gramophone and Typewriter, Ltd., and Sister Companies, along with it’s successor concerns in India cannot claim to be the first to take rs took’ cylinder recordings in 1900, nor can The Gramophone and Typewriter, that honour goes to Mukherjje & Mukharji, and Binapani Recording Co of Calcutta, both of whom manufactured disc records just prior to the opening of the Sealdah factory of The Gramophone Co. By mid-1908, the Sealdah factory had begun to ·service the Indian and Asian market for sound recordings, and this factory became the centre of the record industry in India a virtual monopoly to itself.